Most of you know Chardikala Jatha. You might not know each of them individually but Hari Mander Jot Singh who is one of the three musicians of Chardikala Jatha (and who plays rocking tabla and backup vocals) is getting married this weekend (may 24 2009)!! He is going to be the last of the three to get married. 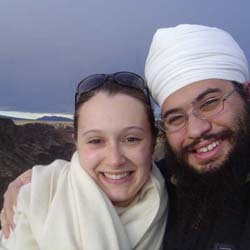 Hari Mander Jot Singh is getting married to Vanessa Bassett here in Espanola, New Mexico. You are welcome and invited to partake of the festivities virtually online! There are two events to tune into. See below for timing and schedule. I just want to say congratulations to veer ji and bhen jee, I wish them all the best for the future. Make a beautiful couple, May Waheguru ji bless you both. I’m just a fan of Chardi kala jatha and enjoy listening to their keertan, they all have beautiful voices. I can’t wait for the jatha to come to England again and do keertan. Your welcome. UK is about 7 Hours ahead of us. So just add 7 hours to the time listed. Cool ! Congratulations Veer Jio … very happy for you and your soon-to-be wife. Vadaiyaan (Congratulations) Hari Mander Jot Singh ji our to be bhabi (sister in law) Vanessa ji! Would you please tell us where the bride is from and where they met? Many blessings to the couple! I will probably be able to watch part of the wedding and am looking forward to it. Thanks so much for providing the online service for us!! Yay! Can’t be there due to exams, but thanks to sikhnet.com I’m tuning into all the celebrations at Siri Singhasan. Thanks Gurumustuk! Congratulation to both of you. Lucky to have each other…. Do you know how to be in touch with someone at Chardikala? I tried the the email address listed on their website but it bounced back. I would like to check with them about performing kirtan at an Anand Karaj. 114704858924246777 - A cool looking Marble statue of an Indian guy on an elephant.